Innovation is central to success for businesses today, yet many large, asset-heavy companies with decentralized business units struggle to combine R&D agility with common, clearly communicable corporate strategies. 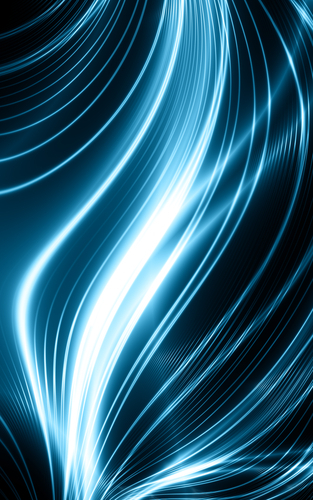 This article, based on experience at a large global energy company, explains how a purpose-driven approach to R&D can deliver innovation agility across the organization. Innovation success for large companies in today’s business world is increasingly reliant on how well they can respond to global competition, fast-moving technology developments and threats of disruption. Agility and dynamism can be especially challenging for large, asset- heavy businesses with long investment cycles, such as global energy, chemicals, and industrial manufacturing groups. These often have decentralized business units (BUs), which makes it hard for the CTO to create synergies across them, maintain clear and transparent linkages between corporate strategy and BU R&D, and communicate the value of R&D externally and internally. Traditional rigid and mechanistic, process-based approaches to setting R&D strategy often fail to address these challenges. In this article we look at a new, purpose-driven approach which has been successfully applied by a large global energy company. The CTOs of global industrial and manufacturing groups with technology-intensive products and services will tell you that despite the undeniable importance of start-ups and other external innovation ecosystem partners, internal R&D still needs to be at the core of the innovation effort. External parties are usually unable to make the necessary resource investments for long-term, core R&D, and in any case, maintaining leading competencies in core technology areas is usually vital to maintaining competitive advantage. Technology mastery: New technologies now often evolve at a faster pace than can be managed internally. The potential to combine innovations from different domains accelerates the pace of change, increasing disruption threats. A rigid technology strategy can become obsolete within months. Business alignment: The traditional “client/provider” relationship between business and R&D, based on annual (or biannual) alignment, is no longer effective. If the logic underlying investment decisions is not transparent, it becomes difficult to understand the value created by mastering a particular technology and how it supports the high-level strategic vision, particularly when technology is rapidly evolving. Fast and continuous alignment is needed on where R&D should focus and what level of performance should be attained. This can only be accomplished by providing decision-making autonomy to support clear product/service attributes defined by the business units. Communicating the value of R&D: Being able to clearly articulate and communicate the value of R&D internally and externally is essential, as with any business function. With few clear links between R&D activities and strategy, articulating value is difficult across a diverse and changing portfolio. Legacy ways of working: Internal R&D organizations often suffer from inefficient legacy management structures, inflexible working practices and cultures of suspicion, often fueled by histories of budget cuts. Over-reliance on “process” often leads companies to continue to work the same ways as they have in the past – but this may not be appropriate for the present and future. Attracting and retaining the best performers: Talent is more mobile than ever before. The new generation of scientists and researchers increasingly value their freedom to create and express themselves, and tend to place higher value on the “meaning” of their work and aligning with inspiring goals or missions. These challenges mean it is increasingly difficult to use only operational, process-based approaches to prioritizing the R&D portfolio. Such approaches often result in poor resource allocation, inappropriate organizational structures and demotivated staff. To overcome these challenges, Company X, a global energy multinational, recently redefined its R&D purpose and innovation strategy, working with support from Arthur D. Little. Company X had already embarked on a major initiative to strengthen its integration across its various business units by defining a common vision (across upstream, downstream refining, etc.). The vision set out a common ambition for the group, and aimed at better coordinating the strategies and resources of each unit and the group, while maintaining a strong culture of entrepreneurship and improving agility. A first step to enabling innovation synergies at group level was begun in 2016 via a new organization, which launched cross-unit transversal programs, coupled with a single, global R&D budget. However, R&D activities were still managed at business-unit level, without group-wide consistency and vision. Company X then launched a project aimed at defining its innovation purpose in a clear and compelling way, and defining how this could be delivered through key assets such as technology, human capital, and ways of working. These were designed to be consistent with each BU’s R&D, which allowed the R&D teams to focus on a common goal and align their program portfolios accordingly. 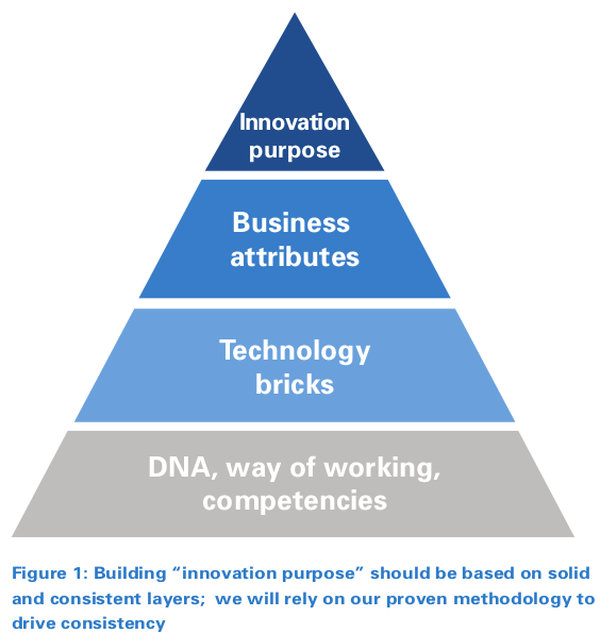 The building process was accomplished by first establishing “innovation purpose pyramids” for each BU, in which an innovation purpose was developed, including business attributes to be delivered, technology “bricks” on which the BU should focus, and ways of working to achieve the goals. Alternatives were then elaborated on for the group innovation purpose through an iterative process, taking into account BU and group strategy input, a company-wide survey, and external benchmarking. The group innovation purpose was then selected based on criteria that ensured relevance, robustness and impact on key stakeholders. Now communicates internally and externally with a single, clear R&D vision and identity, and consistent, credible, sustainable, and impactful messages to its different stakeholders. Is assessing the impact of all its R&D programs in terms of their contributions to business attributes. This impact assessment is used as a key dimension for R&D program portfolio management. Benefits from a clear vision of the impact of its technology bricks and can refine its technology strategy accordingly. This allows for more dynamic, flexible and agile response to changes and disruption, while maintaining a coherent overall direction. Is now able to establish consistent governance, taking technology bricks as the most granular element to be monitored by the R&D executive committee. Give meaning to R&D: Clarify the “raison d’être” of R&D and create coherence within the department and beyond, empowering, motivating and inspiring staff. Ensure clarity and resilience: Create a common understanding to guide autonomous decision-making. Facilitate communication: Articulate a consistent message for different stakeholders, such as shareholders, employees, the R&D team, future recruits, clients and partners. The relatively simple and lean output of this layer hides a delicate alignment process – each word in the purpose can eventually impact the nature of R&D. For example, positioning the R&D department as a “scientific leader” results in different choices and investments than if it were called a “solution provider”. A good “purpose” is much more than just a basic mission or set of aims – it forms the basis of an innovation narrative that both inspires and guides. Making the business explicitly identify the key attributes needed to support it and differentiate its position is an exercise that often goes against the natural trend of asking for improvement in multiple, often conflicting, directions. 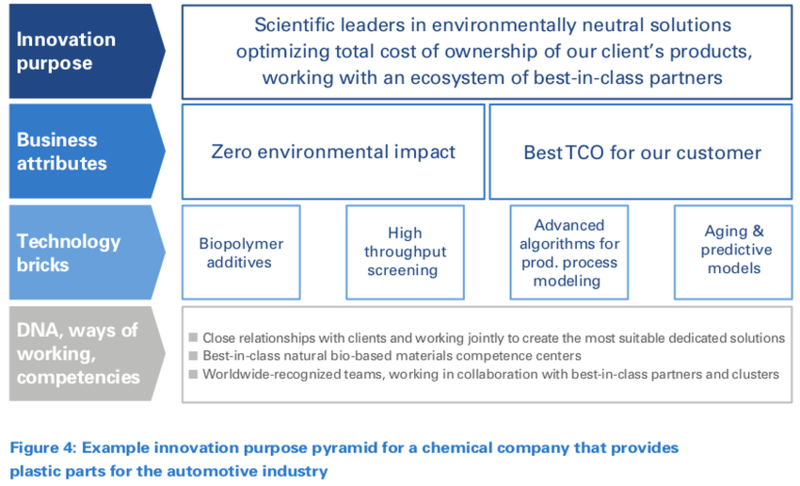 Many R&D teams will have heard, “I want my R&D to provide first-class performance in differentiating our product’s environmental footprint,” and one sentence later, “I want my R&D to work to drastically decrease our product costs.” At the same time, the expected level of performance is an area where business and R&D struggle to clarify or quantify success. For example, “first-class performance on environmental footprint” might be better expressed as “decrease CO2 emissions by 20 percent”. Selecting which technology bricks to support means choosing not to support others, which makes it particularly difficult for groups of curious and passionate researchers. Moreover, it requires deep discussions on the link between technologies and their business impact. This healthy dialog is all too often neglected or covered only at very high levels. Additional complexity lies in the sizing dilemma when defining the perimeter of each brick. A brick should not be too large, as this prevents focused effort, or is too limited, which can lead to a complex and unmanageable inventory of technologies. Apple’s iPod is a good illustration of this approach. It entered the MP3 player market five years after many of the early starters. This gave the company the advantage of both understanding the approaches of competitors and knowing that most of the necessary technology had already been created. Apple therefore focused on leveraging two technology bricks in its device – hard-drive technology that could store thousands of songs and a user interface that appealed to a larger portion of the consumer market. These two bricks allowed it to differentiate and eventually consolidate a fractured market, capture 70 percent of the business, and redefine what an MP3 player should be. These are the key intangible assets, know-how and ways of working (either existing or to be developed) that help to achieve company goals. Each company relies on its own processes, organization, and culture, with these characteristics providing the raw material for its innovation purpose foundations. However, the difficulty lies in understanding their complexity and drawing a clear distinction between the essential ones and those that lead to dispensable bureaucracy, self-justifying their existence. How the purpose is formulated can have a big impact: for example, if the purpose statement in Figure 4 had instead been “Smart integrator of solutions enabling the best compromise between product recyclability and low cost for our clients”, the content of the three layers below it would have been different, even though the basic themes of “environment” and “competitiveness” would have been the same. Applying this approach to a large organization requires close collaboration and input from management, business staff, and a range of R&D staff working at corporate and business-unit level. Typically, benefits can be delivered in eight to 15 weeks, including time to allow sufficient reflection and consultation. 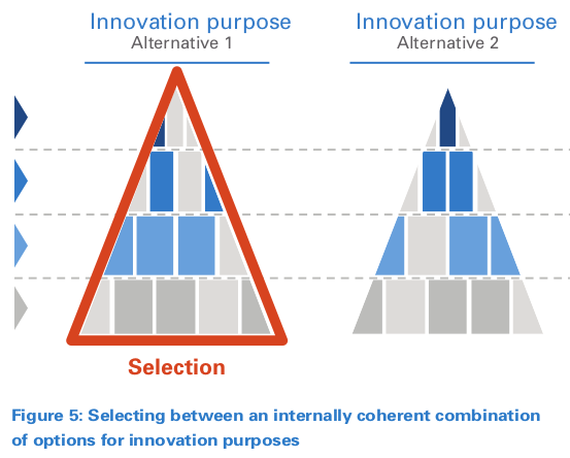 To ensure that the innovation purpose and business attributes are positioned to maximize competitive differentiation, information needs to be gathered on each layer of the innovation purpose pyramid – not just for the company, but also on its major competitors and related market trends. For the internal data gathering, it is helpful to use a structured format for each department to describe mission-critical business attributes supported by R&D, technology bricks to deliver these attributes, and key values. Being clear about terminology and establishing common vocabulary is an important prerequisite. A balance between top-down and bottom-up approaches is needed to set out options for the innovation purpose. In general, the lower the layer, the wider the audience with which the company needs to engage. For example, at the DNA, ways of working, competencies level, a broad range of stakeholders is needed to ensure alignment between R&D and other functions. The technology brick layer is discussed with senior staff who can understand the relative contribution of one technology brick compared to that of another for the wider business. The business attributes layer is discussed with businesspeople who have a clear vision of high-level R&D impact on the market. Throughout the process, it is important to leverage and build on existing roadmaps and relevant linkages here, rather than redesign from scratch. For example, different top-level innovation purpose statements will give rise to different required business attributes, and in turn, different sets of technology bricks, and so on. In this way it is possible to create a limited number of alternative options, each comprising a combination of selections at each of the four layers. This is similar in nature to scenario-planning – the example shown in Figure 4 for the chemicals company illustrates what such an option could look like. Companies should prepare for this phase by establishing criteria such as alignment, actionability, credibility, sustainability, uniqueness and relevance. Broader company strategies, external benchmarks and likely stakeholder impact are used to inform the options selection process, and typically finalized through senior management workshops. Involvement of business executives in the process is important to challenge the business attributes layer in order to ensure full alignment with business strategy. R&D program portfolio management: R&D programs can now be assessed on their contributions to technology bricks and business attributes, which sets the basis for strategic reviews of the R&D portfolio and enables direct monitoring of the R&D program’s impact on business performance. R&D technology strategy: Priorities and levels of investment for each technology brick can now be easily agreed, and thus, suitable make/buy/partner strategies formulated. Communication: A coherent R&D communication program can now be set up, which will ensure consistency of messages for different audiences. Engaging and aligning the organization behind the innovation purpose is key for enabling effective structuring of processes, systems and ways of working to implement these levers. The innovation purpose provides a backbone, a vehicle for engagement across different BUs and functions, a guide for decision-making, and a sense of momentum to drive change. The fast-moving environment, a globalizing and digitalizing world, complex technologies, and evolution of R&D employee expectations are driving critical changes to innovation and R&D management. There is an increasing mismatch between today’s needs and the traditional, heavily process-oriented ways of managing innovation and R&D. To succeed in this new era, companies need to find platforms of stability and consistency to enable them to fully leverage their investments and resources in agile, flexible and dynamic ways. They must also be able to communicate this sense of purpose and direction to the markets and their own staff. The innovation purpose approach provides a robust framework to help companies navigate uncertainty. It engages R&D in a natural transformation process, clarifies the benefits it brings to the business, and helps select the technologies required to differentiate and optimize resources, all while leveraging the R&D department’s culture and ways of working. Reinforce people’s autonomy and inspire the current “meaning-driven” generation of scientists and researchers by clarifying the fundamental purpose of R&D and innovation. Ensure a common understanding of what is expected from R&D to support business success by defining the key business attributes, products and services which are impacted by technology. 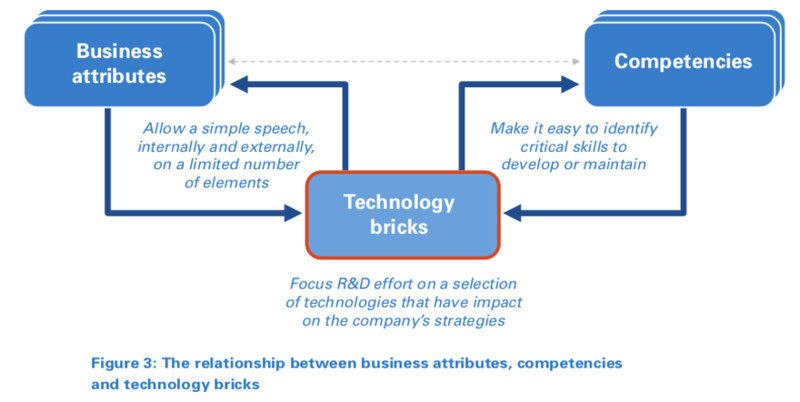 Focus R&D and innovation resources by selecting key differentiating technology bricks that support performance improvement of selected product or service attributes, ensuring that they are defined at the right level to promote agility and flexibility. Ensure resilience and acceptance by making clear the consistency and logical linkages between your company’s guiding purpose, technology-driven strategic business attributes, key technology bricks, and intangible assets. Embracing change is critical for today’s large R&D organizations. Without a strong underlying sense of purpose, continuous change can quickly lead to complexity, uncertainty, inefficiency and low morale. Executives should consider whether they need to take appropriate action.